I have written before about my prospecting and camping trip to Crater of Diamonds State Park, but I think it's time for another post about it. Click here for more information about prospecting and treasure hunting. Interested in contributing to Wikipedia? The Crater of Diamonds State Park is an Arkansas State Park located near Murfreesboro in Pike County, Arkansas, USA containing the only diamond bearing site in the world that is open for public prospecting. The Crater of Diamonds State Park is an 911 acre (3.69 km²) Arkansas State Park situated over an eroded lamproite volcanic pipe. The park is open to the public and, for a small fee, rockhounds and visitors can prospect for diamonds and other gemstones. Park visitors find more than 600 diamonds each year of all colors and grades. Over 25,000 diamonds have been found in the crater since it became a state park. Visitors may keep any gemstone they find regardless of its value (and some, as listed below, have been quite valuable). In addition to diamonds, prospectors may find semi-precious gems such as amethyst, agate, and jasper or approximately 40 other minerals such as garnet, phlogopite, quartz, baryte, and calcite. The crater itself is a 37 1/2 acre (142,000 m²) plowed field. It is periodically plowed to bring the diamonds and other gemstones to the surface. The remainder of the park consists of a visitor center, interpretive Diamond Discovery Center, campground, picnic area, and Diamond Springs aquatic playground. A 1.3 mile (2 km) walking trail along the Little Missouri River is available for hikers. In August 1906, John Huddleston found two strange crystals on the surface of his 243-acre (0.98 km2) farm near Murfreesboro, Arkansas, and soon became know as the first person outside South Africa to find diamonds at their original source. The following month, Huddleston and his wife, Sarah, sold an option on the 243 acres (0.98 km2) to a group of Little Rock investors headed by banker-attorney Samuel F. (Sam) Reyburn, who undertook a careful, deliberate test of the property. After 1906, several attempts at commercial diamond mining failed. The only significant yields came from the original surface layer, where erosion over a long period of time had concentrated diamonds. In the early period, 1907-1932, yields from this "black gumbo" surface material often exceeded thirty carats per hundred loads (standard 1600-pound tramload of the early period). Highest yields from the undisturbed subsurface material (described as "kimberlite" or volcanic breccia, by the U. S. Geological Survey) were two carats per hundred loads in 1908 and about two carats per hundred short tons (2000 pounds)in 1943-1944. Because equipment of the early period usually included bottom screens with mesh larger than 1/16th, thousands of smaller diamonds were allowed to pass through. The bulk of these ended up in drainage cuts of varying depths all over the field and in the big natural drains on the east and west edges of the diamond-bearing section of the volcanic deposit (approximately thirty-five acres of volcanic breccia on the east side of the eighty-acre "pipe"). In recent decades, those small diamonds have been the bread-and-butter of recreational diamond-digging. Soon after the original diamond was found, a "diamond rush" created a boomtown atmosphere around Murfreesboro. According to old tales, hotels in Murfreesboro turned away 10,000 people in the space of a year. Supposedly these aspiring diamond miners formed a tent city near the mine which was named "Kimberly" in honor of the famous Kimberley diamond district in South Africa. On the other hand, all available evidence indicates the Town of Kimberly originated as a land-development venture in 1909, initiated by Mallard M. Mauney and his oldest son Walter on their land immediately south of Murfreesboro. The project failed soon afterward as the speculative boom generated by the diamond discovery collapsed. Today the Kimberly area is almost all cow pasture, owned by Mauney's descendants. From 1951 to 1972, the crater hosted several private tourist attractions. The first, The Diamond Preserve of the United States, lasted only about one year. In late 1951, Howard A. Millar stepped in and salvaged the infant tourist industry. In April 1952, Millar and wife, Modean, launched their "Crater of Diamonds" attraction. Howard Millar, an accomplished writer and promoter, stirred unprecedented national publicity and drew enough visitors to sustain the operation. In March 1956, a visitor found the "Star of Arkansas" on the cleared surface. The rare beauty weighed 15.33 carats. Later, Roscoe Johnston opened a rival tourist attraction, the "Arkansas Diamond Mine," on the main part of the diamond field. The rivalry between the two tourist operations left both in a weakened position. In 1970 the entire volcanic formation was consolidated by a private partnership which then reassigned the property to General Earth Minerals of Dallas, Texas. GEM expected to turn the property over for a profit, but ended up heavily indebted to GF Industries of Dallas. Upon default, GFI took the property in July 1971. GEM consolidated the tourist operation as well as the property. GFI continued the attraction until it sold the eighty-acre volcanic formation and some 800 surrounding acres to the State of Arkansas in March 1972, for $750,000. The tourist operation continued as the centerpiece of Crater of Diamonds State Park. Due in part to the park, and also because Arkansas was the first place outside South Africa where diamonds were found at their original volcanic source, this special gem has come to be associated with the Natural State. A large diamond symbol has dominated the state flag since the early years. The Arkansas State Quarter, released in 2003, bears a diamond on its face. The Crater of Diamonds volcanic pipe is part of a 95 million-year-old eroded volcano. The deeply sourced lamproite magma, from the upper mantle, brought the diamonds to the surface. The diamonds had crystallized in the cratonic root of the continent long before, and were sampled by the magma as it rose to the surface. The lamproite diamond source is unusual, as almost all diamonds are mined from kimberlite and from alluvial deposits of diamonds weathered from kimberlite. The most prominent lamproite diamond source is the Argyle diamond mine in Australia. 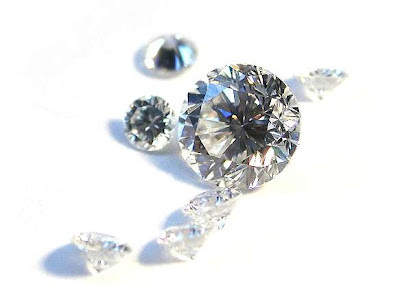 1990 – Shirley Strawn - 3.09 carat "Strawn-Wagner Diamond" – cut to 1.09 carats in 1997, and graded a "perfect" 0/0/0 by the American Gem Society in 1998, making it the first diamond ever to receive such an AGS grading. Currently on exhibit at the park. 1997 ~ Richard Cooper - 6.72 carat "Cooper Diamond" - unusual deep purplish-brown. 2006 ~ Marvin Culver - 4.21 carats "Okie Dokie Diamond" - deep canary yellow and flawless. Seen on Today Show, MSNBC, Inside Edition and Travel Channel and published in Lost Treasure magazine (twice), Western and Eastern Treasures magazine, Mineralogical Record and Rocks & Minerals. Arguably the most publicized diamond from the Crater. 2006 ~ Bob Wehle - 5.47 carat "Sunshine Diamond" - deep canary yellow and flawless. Dec. 2006 ~ Donald and Brenda Roden - 6.35 carat "Roden Diamond" -- honey-brown. 2008~ Denis Tyrrell - 4.42 carat "Kimberly Diamond"
http://www.pcahs.com/Arkansas_Diamonds/idxFr2.htm History of the Crater, thoroughly documented. This page was last modified on 18 August 2008, at 01:53. Check this link for more info on prospecting and treasure hunting.